Microsoft is offering free Bing Webmaster Tools to improve your website. It can help your blog in getting indexed by Bing search engine and Drives more organic traffic. By Submitting a site map, It gives detailed reports about websites link to your site or blog (back links). Bing webmaster center provides statistics about your sites. Here you can identify any issues that Bing encountered while crawling your site or blog. 1. Open Bing Webmaster page here. 2. Sign in to Webmaster Tools using Windows Live ID like hotmail. 3. Click on Add a Site and enter required details like blog address and sitemap address. Now click on submit. 4. 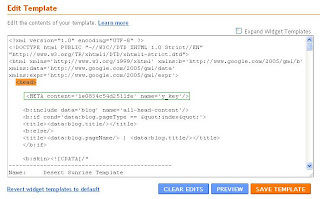 Authenticate your ownership of your blog by inserting a Meta Tag into HTML. For this copy the Meta tag and follow below mentioned procedure. 5. Now open Dashboard in Blogger --->> Next click your blog Design option --->> then click Edit HTML. 6. Find <head> tag (click ctrl+f to search it) and Paste Meta Tag just below it. Click Save Template. 7. Now click on Return to Site List. You have added your blog and wait for improvement. You can also make use of Google Webmaster Tools that helps you in bringing more organic traffic from Google search.